One notable entry on the list of Shows To See This Week is the return of a weekly way to end your weekend in sultry style. 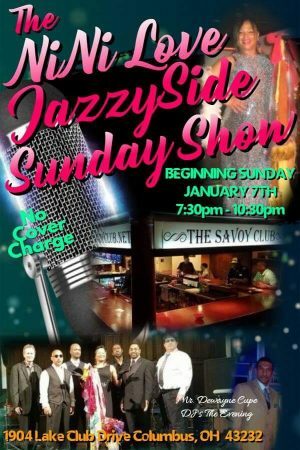 Starting last week, NiNi Love JazzySide is now holding its free weekly Sunday Shows at The Savoy Club every Sunday from 7:30 to 10:30pm. As vocalist and bandleader NiNi Love told me, “Our ‘Sundays’ Shows offer a constant variety of great musicians that come and join us for a selection or two throughout the evening! It’s a spectacular night of entertainment in a warm and inviting environment. We are always adding to the show to keep a variety. We have recently added a few more originals: ‘Take Me To Paris’ and ‘I Love You.’ We have also added our spin and favor to ‘Maria Maria’ originally by Carlos Santana. We end with an amazing Latin celebration where I play the Agogo Bells.” This is a great venue to enjoy the band’s soulful take on jazz and much more, and this weekend you have two chances to see them there, as they are celebrating their drummer Cleve Brown’s birthday on Saturday, January 13th from 9pm to midnight (details and table reservations here). Wednesday, January 17th (8 to 11pm): Jazz Wednesday with KGB Trio at Brothers Drake. This week’s portion of the always inventive lineup of free shows on Wednesday nights at the meadery features the first of two January appearances by Cincinnati groups (On A Limb plays on the 31st). KGB brings esteemed Cincinnati musicians Josh Kline (tenor sax), Peter Gemus (bass), and Tom Buckley (drums) to the stage for a night of “original compositions as well as music from a wide range of composers, from Ornette Coleman to Cole Porter.” Grab a glass of mead (or the beverage of your choice) and enjoy lively jazz without staying out too late!